Miss Stein a Wow; Her Lectures a Sellout She’s Such a Hit. 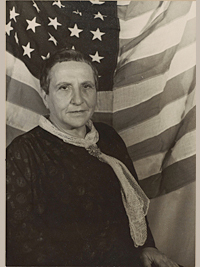 Beginning in 1933, when her book The Autobiography of Alice B. Toklas became a best-seller, Stein became a celebrity in her home country. In 1934 the opera she created with Virgil Thomson, Four Saints in Three Acts, opened on Broadway; and in the fall of 1934, Stein returned to the United States for the first time in nearly thirty years. 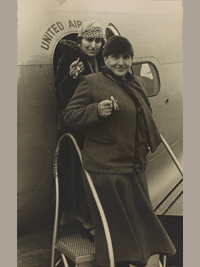 For seven months, with Toklas at her side, Stein traveled by car, train, or plane across America, speaking about her writing and love of modern painting to the young on college campuses and to art associations and museum audiences. She averaged two to three lectures a week—about seventy in all—and finally achieved the fame she always desired. The press lionized Stein, giving her more coverage, headlines, and photographs than she had ever before received. 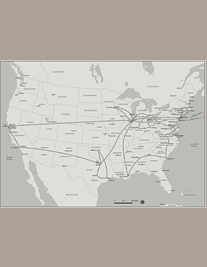 On returning to France, Stein continued to write books and articles for her new American public until the Second World War cut off access to the outside world. 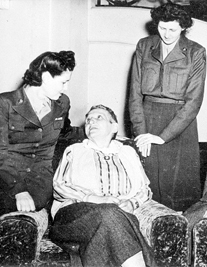 But once the Allies achieved victory, Stein became famous all over again for the lavish attention she bestowed upon on the young American GIs who visited “Gertie” in Paris. During World War I Stein and Toklas served as volunteers for the American Fund for the French troops. 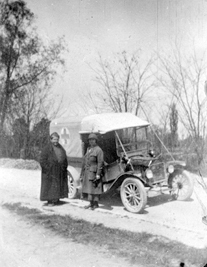 Stein ordered a Ford truck from the United States, learned how to drive, and with Alice delivered supplies to French hospitals. They called the truck, their first vehicle, “Auntie,” named for Stein’s sensible Aunt Pauline, “who always behaved admirably in emergencies.” To show friends their wartime efforts, they sent photographic postcards of themselves with “Auntie.” These were the first photographs documenting the two women at work as a couple. The French government awarded them the Médaille de la Reconnaissance Française for their service. Stein’s decision to live out the second World War in southeastern France was a risky if not foolhardy decision. She was advised on three occasions to leave Nazi-occupied France. She was Jewish, American, homosexual, and a radically modern artist, making her a highly potential target of Nazi persecution. German soldiers billeted with the women on two different occasions and Nazis broke into their unoccupied home in Paris, threatening to harm their collection. Recently scholars have learned that Stein’s close friend, the writer Bernard Faÿ who rose to prominence in the Vichy government, looked after their safety and that of their art collection. The exact form of his protection remains unclear, as does the amount of contact Stein and Toklas had with Faÿ during the darkest days of the war. What is certain, however, is that after France was liberated, both Stein and American journalists explained her survival as a simple matter: the Germans never recognized Stein as a famous American writer. 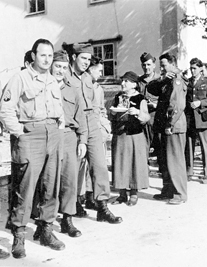 When the war ended, Stein’s newly aroused patriotism led her to invite hundreds of GIs to the home in Paris, feeding them and showing off her collection; she also accepted invitations to lecture to and talk with U.S. troops wherever they were stationed. Her fondness for young American soldiers—she called them godsons—which had begun during the first war, became newsworthy and good press copy in 1944–45. Stein’s Wars I Have Seen, written behind enemy lines from 1942 to 1944, the two years she was out of communication with the outside world, sold briskly and put her life back in the American press. War was Stein’s last big subject.